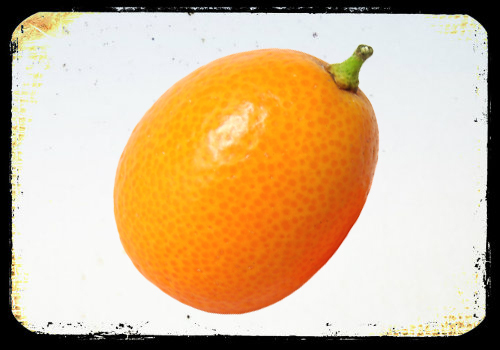 The kumquat tree is slow-growing, shrubby, compact, 8 to 15 ft (2.4-4.5 m) tall, the branches light-green and angled when young, thornless or with a few spines. The apparently simple leaves are alternate, lanceolate, 1 1/4 to 3 3/8 in (3.25-8.6 cm) long, finely toothed from the apex to the middle, dark-green, glossy above, lighter beneath. Sweetly fragrant, 5-parted, white flowers are borne singly or 1 to 4 together in the leaf axils. The fruit is oval-oblong or round, 5/8 to 1 1/2 in (1.6-4 cm) wide; peel is golden-yellow to reddish-orange, with large, conspicuous oil glands, fleshy, thick, tightly clinging, edible, the outer layer spicy, the inner layer sweet; the pulp is scant, in 3 to 6 segments, not very juicy, acid to subacid; contains small, pointed seeds or sometimes none; they are green within.